trying to earn its living. Here are a few good examples. One good way to show both ends of a railroad in a small space is to forget about the middle part … just eliminate the miles of track the train must travel to get from A to B. 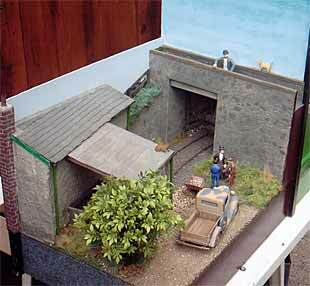 Bob Hughes, from Cheshire England, has done exactly that in his tiny G-scale layout, Green End Quarry. 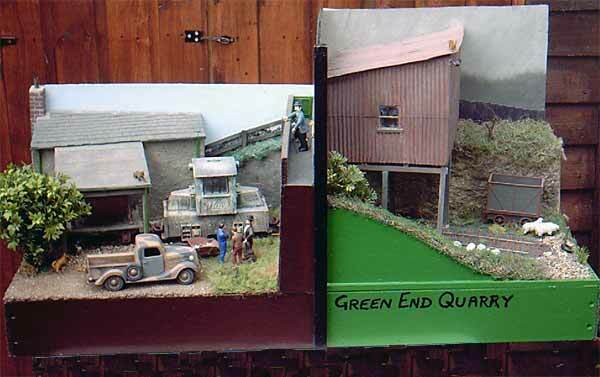 Measuring only 39×18 in (100×45 cm), the layout features a simple divider between the Quarry (at the green end, where the cars are loaded by gravity from the back) and the Reddish Mill (where the cars are tipped into a bin at the rear). The track plan? Just a length of gently curved track in 45mm (1.75 in) gauge! At the left, Bob’s small loco positions the vee-skip under the quarry tipple, where an Invisible Hand can fill it. (Notice the cat on the hot tin roof, whose dinner has just escaped!) Then the train journeys to the other end (below), where a hidden hook grasps the edge of the tip to empty it. For more, see Bob’s website. Another strategy is to provide a short distance for trains to haul their freight between loading and unloading, affording some train-running time in a very small space. 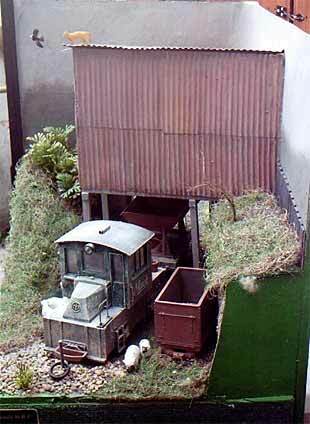 That’s the approach used for Martin Hogg‘s Gn15 industrial layout built in an unused wine box measuring 12x3x6.5 in (305x80x165 mm). Here, as in the case of my Squarefoot Estate Railway, there’s only a short distance (a couple inches) to travel as the crow flies, but the track is arranged so the railroad goes somewhat farther! 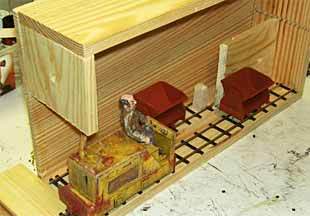 Conceptually, Martin’s layout will look like this. 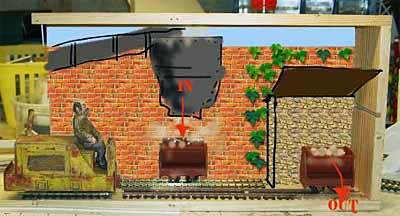 Trains are loaded with rock or gravel at the bin above the rear track, then pulled to the left onto a cassette (made from the box lid) which moves them over to the front track. They’re then pushed to the tip and emptied there. Martin, from Mansfield England, has more info at his website. 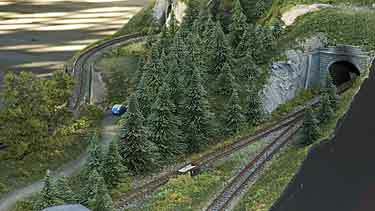 A different approach is to place the model railroad on an island and declare that the model is the entire line! There are several examples of such an island road in Scrapbook #36, and here’s another — Canon Island by Carsten Weye Jensen, from Holstebro Denmark. This N or Z scale road measures 15×12 in overall (385×305 mm), about a square foot by the time you cut the corners off. The fiction is that the line receives interchange cars by ferry, switches all the local destinations, then ships out loads and empties on the return ferry. 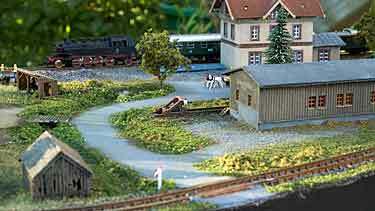 By making a train turntable part of the village square, Carsten has managed to find a way to distribute traffic all around the island by simply turning on a dime in the middle (or is it on a krone?). Carsten comments, “The ferry can hold two short cars, the turntable can hold a short car and a loco, and all the sidings except for the General Store can hold two cars, or a car and a loco. The ferry could also hold a motorized passengerwaggon [coach] and a very short (40mm) car.” Note: Scenery shown is designed to Z scale; the plan would also work in N scale using short-wheelbase rolling stock. If a little more room is available, it’s possible to model both ends of the line and connect them with a length of track so the trains appear to travel some distance between termini. Graham Watling, from Norwich England, calls this an “up one side and down the other” type of railway using a central back screen — and his Sampson Vale layout is an excellent OO9/HOn30 example in 20×30 in (50×75 cm). 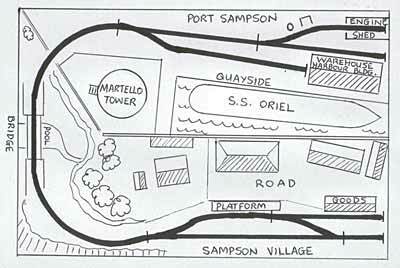 The line is a fictitious Channel Island railway connecting Sampson Village with Port Sampson and its quay. Graham built a high perimeter wall for the port area. and the train travels through an arch in the wall then over the bridge over a stream near a waterfall and round a bluff in the hillside into “Sampson Village” station. For operation at exhibitions, a railcar service alternates with a goods train usually hauling three wagons, which is shunted around at the Port on arrival. Two locos are needed at the Port to shunt wagons. Graham’s wife, Caroline, made all the trees, gardens, and shrubland. Of particular interest is the model of a Martello Tower, visible in one of the photos, which is a fortification found on several of the Channel Islands, particularly Guernsey. Yet another approach to getting from A to B in a single layout is demonstrated by Marty Johnston‘s Von Leipnik’s Interplanetary Transport Co.Set on an atoll far from civilization, the two-foot-gauge railway — under construction in 7/8 in scale (1:13.7) — models all of the significant landmarks on the tramway. But the design conceals many of the the connecting tracks inside the walls and a behind a bookcase. This is not a small railway, but it is very much in the small-railroad spirit. 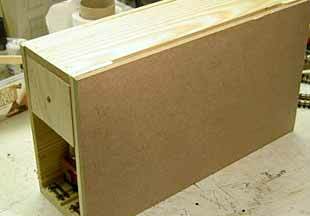 And in O scale it would be only about 4×3 feet in overall size! These are very large trains — the gauge between the rails is 45 mm (1.75 in), which represents a prototype two-foot gauge! 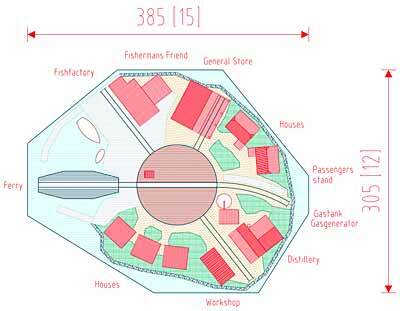 Marty explains the plot this way: “Supplied by ship nine months of the year and serviced by a 2 ft tram, the site includes a machine shop, library, laboratory, rocket launch pad and observatory as well as a handful of other structures. It’s 1926 and Otto Von Leipnik is working hard to repeal the Second Law of Thermodynamics…”Some Details: The majority of the layout resides in a bookcase/wall that separates my modeling area from the laundry room. I am in the midst of completing the trackwork before I can move on to the buildings. 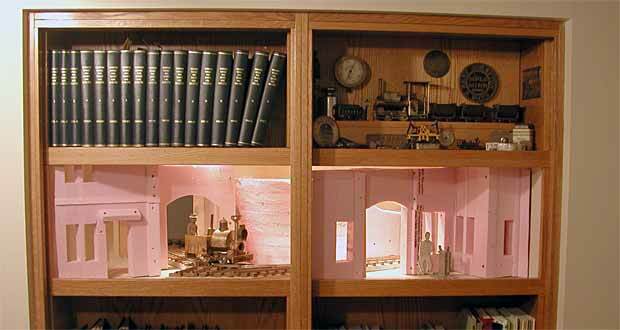 On the right half of the bookcase scene you are looking out through the machine shop at the ship. The left-half of the scene opens onto the laboratory and library. In the dock area the tracks will be embedded in stone and wood.” For more details of this incredible construction, see Marty Johnston’s website! He lives in St. Paul, Minnesota USA.